Learn the Comminuted clavicle fracture – internal fixation with Stryker Variax 2 locking plate surgical technique with step by step instructions on OrthOracle. Our e-learning platform contains high resolution images and a certified CME of the Comminuted clavicle fracture – internal fixation with Stryker Variax 2 locking plate surgical procedure. Clavicle fractures are common accounting for around 4% of all fractures and up to 44% of fractures of the shoulder girdle of which the middle third is by far the most common site. The management of such injuries can be difficult and outcome can be unsatisfactory. 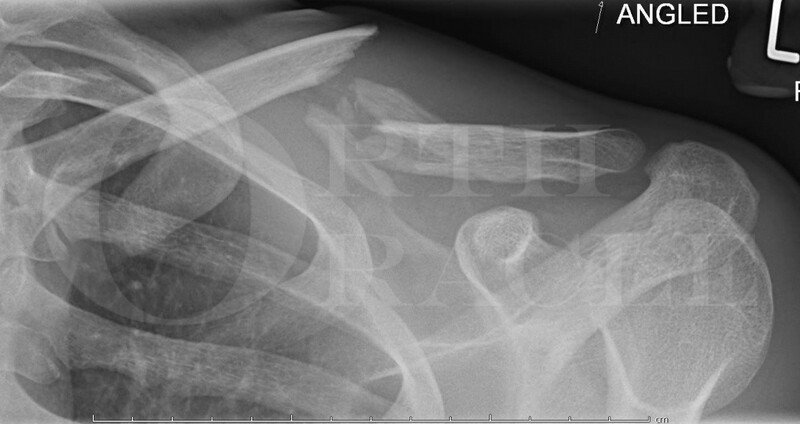 There has been reported non-union rate of displaced mid-shaft clavicle fractures of between 15 and 20%. This can be reduced significantly with surgical intervention. Whilst there is risk and some potential complications with any surgical intervention the published results demonstrate that plate and screw fixation can be performed safely to give a good outcome with improved patient satisfaction and a reduction in the non-union rate compared to conservatively managed fractures. There are many implant companies with clavicle specific plates. Described here is the use of the Stryker VariAx 2 clavicle locking plate system. These contoured and sided plates are available for lateral injuries, superior shaft fractures and for use along the anterior face of the clavicle. The plates and screws are made of different grades of titanium allowing the harder locking screws to cut their own thread within the softer material of the plate and their position can be adjusted up to three times. Screws are available in sizes 3.5 and 2.7 in both non-locking and locked varieties. The clavicle set also provides useful instruments to facilitate exposure with periosteal elevation, fracture reduction in terms of clamps and wires as well as plate holding clamps.